Permeable paving refers to street and sidewalk paving materials that allow stormwater to filter through to the soil below. Permeable paving materials like porous concrete or unit pavers may look similar to traditional paving materials but allow air and water to pass through the paving material, providing the opportunity for temporary storage of stormwater runoff and/or groundwater recharge into the soils below. Permeable paving can be used on various portions of the public right-of-way. Permeable paving may be installed by small property owners, by major new development or as part of corridor-wide improvements. Applicants are encouraged to apply as multiple property owners along a block or neighborhood to enhance the project’s benefits and lower costs to the applicants. Talk to your neighbors about putting together a joint application for permeable paving. Permeable paving located in the sidewalk area requires a Special Sidewalk Surface Permit. A Special Sidewalk Surface Permit grants permission to replace standard concrete sidewalk with alternative paving materials, including permeable paving. A permit is required to ensure that permeable paving is properly constructed and maintained in order to maximize environmental benefits, protect public safety and limit conflicts with infrastructure. Permeable paving may be built as a standalone feature, or in coordination with other streetscape and stormwater management features, such as street trees, bioretention planters, or sidewalk landscaping. If permeable paving will be installed in combination with other streetscape features or constructed in the roadway, parking lane, medians, or other areas, the project sponsor must obtain relevant permits for all features. DPW will generally combine multiple features into a single permit. Within 50 feet of domestic water wells if receiving runoff. Soils: Permeable paving requires an understanding of the prior use of a site. Site tests should be performed to determine soil conditions including: percolation rate and infiltration capabilities, depth to seasonal high water table, depth to bedrock, and soil contamination. Existing subgrade should be able to demonstrate a minimum permeability rate of 0.5 inches per hour. An underdrain may be used in soils with lower infiltration rate in order to obtain the minimum permeability rate. Percolation testing to identify the infiltration rate of the native soil will determine the depth of base rock for the storage of stormwater, and whether an underdrain system is necessary. Permeable paving must maintain separation of 4 feet above both the high water table and bedrock for proper performance. Permeable paving should not be installed over new or existing compacted fill. Permeable Paving is appropriate for installation in both small projects sponsored by individual property owners as well as larger block-scale or neighborhood-scale projects involving multiple LID features. Accessibility: Selected paving materials must be ADA-compliant, and not cause tripping hazards or excessive vibration. As with all paving materials, permeable unit pavers should leave gaps of no more than ¼” inch wide, or up to 1/2” wide with beveled edges. Beveled edges should only be used to mitigate vertical change. Vertical changes should not exceed a slope of 1:2. Both permeable pavers and porous concrete have the added benefit of elimination of polycyclic aromatic hydrocarbons (PAHs) from the wastewater stream. Where porous asphalt is used, PAH-free asphalt alternatives should be considered as a source-control measure. Incorporate appropriate sediment reduction techniques wherever possible. Maintain erosion and sediment control measures until a site is stabilized. Remove all compacted sub-base and avoid compacting soils during construction. Spread the infiltration over the largest area feasible. Avoid concentrating too much street or sidewalk runoff in one area. Most types of permeable pavement (pervious concrete, porous asphalt, and permeable unit pavers) can receive run-on from adjacent areas: permeable paving on streets and sidewalks should be at least 25% of the total drainage area. Avoid smearing of underlying soil, to minimize sealing of soils. Avoid contamination with sediment; avoid tracking sediment onto pavement. Avoid drainage of sediment laden waters onto pervious surface or into stone sub-base constructed bed. Do not allow construction staging, soil/mulch storage, etc. on unprotected pavement surfaces. The bottom sub-grade should be graded level to allow even distribution of infiltration where soil conditions provide for permeability. Where provided, underdrains should be placed at the pavement edge to provide drainage that prevents ponding. Existing compacted or otherwise impermeable sub-base should be fully removed to prepare the soil for infiltration. 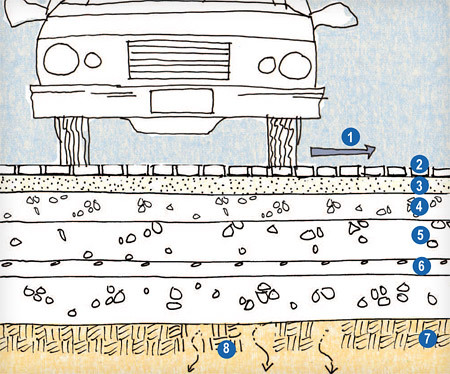 Permeable pavement requires periodic maintenance to retain its infiltration capacity. Permeable pavement should be vaccuumed once or twice annually. Vaccuuming has been found to be most effective when sediments are dry. If routine cleaning does not restore infiltration rates, then partial or full reconstruction of the pervious surface may be required. Also, broken or damaged pavement needs to be removed and replaced. Once a year, the paving should be tested to determine if it is clogged.